My file below contains examples of ways the MS Excel can be used as a writing aid. The grid format makes it easy to record information or a list of subjects i.e. character details. It's also handy for recording information over time, whether that's day by day, chapter by chapter or four thousand years of world history. Below are four examples of sheets I've created. These, plus other examples, are available in the file below. A simple, but very usable, table for keeping track of submissions. 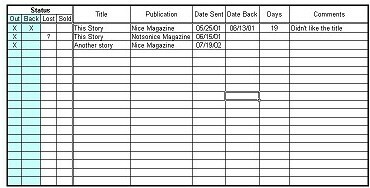 Table can be sorted by any column so you can order it by title, magazine or status, as desired. I find this handy when I want to write a story set in the future or past of a pre-existing set of characters, or if I need to work out who was present when historical events occured. 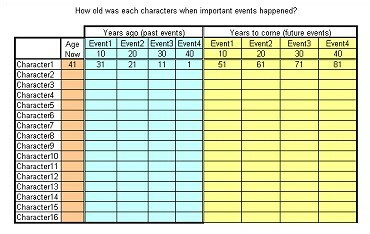 Change the intervals given (currently 10, 20, 30, 40) to the new interval and put the characters' current ages in the 'Age Now' column, and the rest is automatically filled in. 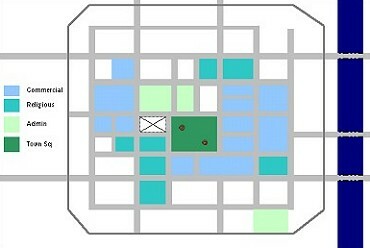 A city map. Done by adjusting the row heights & column widths, and then filling in the cells in various colours. Obviously most useful for cities with blocks. I've included a quick house floor plan & basic castle layout in the file below. For keeping track of what the main characters should be doing each day, and what is happening in the rest of the world at the same time. There is a second page with a shorter period of days divided into morning, afternoon & night in the file below. 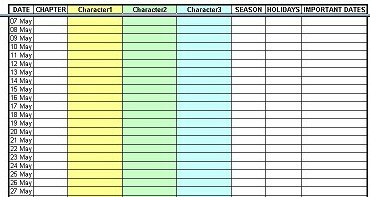 This file is provided as an example of how you can use Excel for writing & world building purposes. You are welcome to use the tables as provided or adapt them for your own use. However, if you want to distribute it, please give me credit for it. Do not make it available on other websites, rather link back to this page. That will also mean the lastest version (yes, it changes) is available at all times. It was saved as MS Excel 97-2002 format, which means it should open in recent and current versions of MS Excel, but it won't open in earlier versions. It should open in Open Office too, but I can't test it now. Because of the use of formulas and link, it can't be saved as a CSV. This is the spreadsheet I use to track my word count for the annual NanoWrimo competition/dare. If you don't know what this is, check out the link. To use, just enter your word count in the lilac column. PLEASE NOTE this hasn't been tested by anyone except me so I don't know how much explanation it needs or if it's all working correctly (I've made changes since last use). And it's rather colourful. Created in Excel 97.